I was driving the kids to school one morning, and stuck in the usual weekday morning traffic, when I noticed a billboard featuring a toilet. Yes, a toilet. 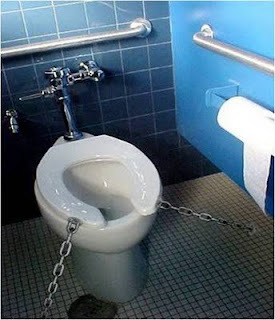 The headline read "John, for God's sake, can you please learn to put the toilet seat down!" Indeed, the seat was up in the offending photo. Apparently, a woman felt so strongly about this issue that she purchased billboard space for one week to communicate her distress to her husband, who was presumably stuck in the same traffic jam as me. The use of the word "learn" is telling here, implying an objectively correct answer that men are simply incapable of getting. We're obviously too stupid to realize that the seat belongs down. But in reality, of course, the toilet seat issue involves conflicting preferences rather than objective truths. There is no correct answer. Now let's consider the underlying issue here. Women need the seat down, whether they are going number 1 or number 2. Men prefer to have the seat up for number 1, but down for number 2. Let's assume that the average person does four number 1s for every number 2. That means in a normal marriage, 60% of all toilet usage occasions involve having the seat down, hardly a basis for the 100% down policy so vehemently advocated by women everywhere. I was reminded of this vehemence during a professional "retreat" where 7 male and 2 female colleagues shared a townhouse for the weekend. One of the women came down the stairs and angrily objected to the seat having been left up by the previous user. I innocently enquired as to why the seat should be left down given the ratio of men to women. Big mistake! She didn't speak to me for weeks. But let's do the math. [7/9 people x "up" 80% of the time] = 62% "up" usage occasions. [2/9 people x "down" 100% of the time] + [7/9 people x "down" 20% of the time] = 38% "down" usage occasions. For that weekend, I was perfectly in my right to suggest that the "norm" for the townhouse should be "up" for that fateful weekend. Having almost certainly stirred the ire of any female readers, let me now move toward reconciliation by noting one more rather unpleasant research finding. When you flush a toilet, tiny particles of faeces and droplets of urine fly everywhere. They are small, so we don't notice them, but they are, nevertheless, disgusting. Is there a way to prevent this unhygienic phenomenon you ask? Why yes there is! You can, get this, put both seats down before you flush. This should be the norm for every household. And think of the other benefits. Do you really need to see what's inside a toilet bowl? Even a relatively clean one that has been flushed by the previous user isn't exactly pleasant to look at, which is why a thorough examination of the inside of a toilet bowl is such an effective technique for inducing vomiting when one has an upset stomach. Put both seats down! Problem solved. Let's move on. Why do I have to juggle my responsibilities in the office and at home? Why do I experience this kind of conflict as a single parent, seemingly on a daily basis? Research suggests that single mothers are more likely to experience this kind of role conflict, but I suspect that it's really single parents that experience it, it's just that we single dads are a mere blip on the demographic radar screen. So being a single parent creates role conflict, and conflict is not good. Does this mean that single parents are less happy than other demographic categories? Well, yes, sort of. Studies show, for example, that parents are on average less happy, and more likely to experience depression, than non-parents. But we really must question any notion that raising children is depressing. This simply flies in the face of evolution. I mean, what is the purpose of human existence, you know, the grand principle that seems to guide virtually all life on earth? I'd say it has something to do with reproduction, or more precisely, replicating our genetic material, and having babies is how we humans do it. How could fulfilling our grand purpose possibly be depressing? If anything, our genes would make it more psychologically painful not to reproduce, and there is evidence that women who do not have children are more depressed than women who do, holding many other happiness factors constant. Men in general are assumed to be depraved until proven otherwise. When it comes to gender discrimination, nobody mentions the rather disconcerting stereotype that men are especially likely to be foul in some way or another, and being a good father, demonstrating the ability to love and nurture children, doesn't allow an escape from this sinister suspicion. More generally there is the persistent notion that fathers have their place in this world – the office – but when it comes to matters of how their children will be raised, dads are not to intervene. They are incompetent parents at best and potentially dangerous at worst. Mums call the shots, and any deviation from these rules of engagement is punishable in a variety of ways, something I was confronted with one Monday afternoon. I was shopping in a department store. Given the time and day of the week, the store was relatively lacking in shoppers, and almost all of the ones there, except me, were women. I hadn't really planned to shop. Indeed, single parents rarely have the luxury of planning anything. Rather, what happens is that some unexpected circumstance affords a sudden opportunity to go shopping. In this case it was the cancelation of a 1.30 meeting that gave me a 2 hour window after lunch.